MARLBORO, NY, June 5, 2018—The co-founding members of the Hudson Valley Cabernet Franc Coalition (HVCFC) are publicly expanding their work by launching a distinctive seal that will mark locally produced bottles that meet the Coalition’s strict standards of high-quality production and authenticity. The seal—which features a soaring hawk, several species of which are indigenous to the Hudson Valley region and are integral to the area’s vibrant and thriving ecosystem—guarantees that 85% of the grapes used in making the wine are grown in the Hudson Valley and that the wine has been aged for at least 12 months. 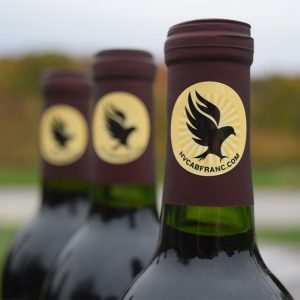 The hawk icon symbolizes the unified commitment of Coalition members to grow and produce Cabernet Franc wines that capture the region’s terroir in every sip. The Coalition was formed in 2016 with the support of local growers, winemakers, and industry organizations; its mission is to showcase the many high-quality, terroir-driven Cabernet Franc wines produced by a growing number of dedicated winemakers, and to encourage more plantings of Cabernet Franc vines throughout the Hudson Valley. The seal will not only appear on locally produced bottles, but also other coordinated marketing materials including vineyard signs and window decals for producers, special signage at events, and promotional postcards. The seal will be a centerpiece as the Coalition promotes the second annual Hudson Valley Cabernet Franc Week (November 27 to December 4, 2018, which is National Cabernet Franc Day) as increased retail opportunities and industry tasting events across the region are planned. 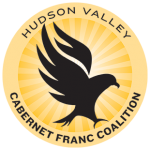 The Hudson Valley Cabernet Franc Coalition (HVCFC) is a group founded in February 2016, composed of Hudson Valley winery owners, grape growers, winemakers, and wine industry supporters. The HVCFC’s mission is to establish a Cabernet Franc brand identity for the Hudson River Region; encourage more vineyard plantings of Cabernet Franc; promote Hudson Valley Cabernet Franc wines to the broader regional area; and increase the visibility of the Hudson River Region appellation, and the wineries within it. The 2018 Coalition Legacy Members include: Fjord Vineyards, Glorie Farm Winery, Milea Estate Vineyard, Millbrook Vineyards & Winery, Nostrano Vineyards, Robibero Winery, Tousey Winery, and Whitecliff Vineyard.